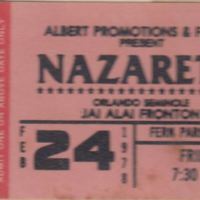 A ticket stub for a concert featuring Nazareth at Orlando Seminole Jai-Alai Fonton in Fern Park, Florida. The opening bands were Mahogany Rush and Sammy Hagar (b. 1947). The concert took place on February 24, 1978, and was presented by Albert Promotions and FM 107. The ticket price was $6.50. Orlando-Seminole Jai Alai Fronton was built in 1962 and hosted concerts, graduations, and events in addition to jai-alai matches, which remained popular through the mid-1980s, when its popularity began to decline. The building was re-branded Orlando Live Events (OLE) in 2014. It is located at 6405 South U.S. Route 17-92 in Fern Park. Original ticket stub: Private Collection of Julie Wahl. Digital reproduction of original ticket stub. Hagar, Sammy, and Joel Selvin. Red: My Uncensored Life in Rock. New York: !t Books, 2011. Erlewine, Stephen Thomas. "Nazareth: Artist Biography." AllMusic.com. http://www.allmusic.com/artist/nazareth-mn0000377891/biography (accessed February 24, 2015). “Nazareth Ticket Stub.” RICHES of Central Florida accessed April 20, 2019, https://richesmi.cah.ucf.edu/omeka/items/show/4777.